This was the plan, over 25 days of ADK deep woods hunting bliss. I pack a month's worth of clothes, food and supplies. We leave Long Island around 5 am, make it into Moose River Plains around noon and set up base camp. Everything is setup just as it gets dark. After a great meal and a tribute salute to our dearly departed friend Chris Flathmann we get to sleep early from exhaustion, at least I did. Day 2 - November 7th... My Birthday! I woke up late, tired from setting up base camp, with the knowledge that I had ten straight days of adventure ahead. The extra time to get out had many benefits one includes a nice breakfast! Thanks Mike! The morning was overcast with rain ( hard at times ), dark and gloomy. Mike stated he had no rain gear and would probably stay at base camp, I offered some gear to no avail. I get dressed and head out by 9 am. Mike was not happy in the muddy camp and bad weather. He seemed resolved to sit out the worst of the storm, something I could not fathom. In this location and time, regardless of the weather, I’m in the woods. Half a mile plus from base camp with cold wet hands I realized I needed water proof gloves. “No turning back now.” Still hunting, I made my way to the spot where I was lucky with my 2010 buck and paid my respects. This area is filled with vegetation and good browse. After my 3rd ridge top I jumped something out after using my doe call, I tried rattling it back with no results. Making my way up to where I shot my 2010 buck I did not see any deer so I figured it went the other direction. At 1:37 pm I headed back about a mile where I missed my 2010 Birthday buck, this spot was about a half mile from where I jumped a deer earlier and was a good choke point with an abundance of beechnuts. Sitting in cover I tried some doe calls. After about thirty minutes of silence I heard a grunt in the direction I know deer travel. I responded with a similar low toned young sounding grunt, no response to my grunt call so I kept quiet. I could hear a rubbing noise just out of view and was wondering what it was. Something was just below the ridge I was on and out of sight, but I could hear it make what sounded like three rubs in about a half hour time period. After venting his frustrations on a few trees he wanted to see what was going on and walked up the ridge into my view. He made a soft low grunt. Shocked I hesitated for a minute contemplating if I would shoot, but that was short lived as the mood changed with a virtual slap on the head from Chris saying SHOOT! The decision made, my heart pumped and the safety came off. His silent steps were bold and full of confidence with his eyes piercing the woods for any activity in front of him. I was amazed at his bold approach and raised my gun only when his eyes were hidden behind a tree as he walked the ridge. The lever action .44 mag cracked the silence! He ran from about 35 yards in front of me downhill to about 40 yards above me uphill in a big half circle as two more rounds were sent his way. Boom! Boom! Check gun, live round in chamber, safety on. Due to so much rain and bad weather I did not try blood tracking. I climbed straight up to the last spot I saw him. Not seeing any movement as I scanned 20-50 yards uphill? I started to think that maybe I MISSED him? Getting the GPS to mark my spot I contemplated how hard this tracking job would become with him out of view. I scanned to my left and 10 feet away he was down and out. Two rounds behind the shoulder ensured a quick and ethical kill. Shocked and in bliss, I unloaded and thanked GOD multiple times. I stood in disbelief at what just happened and the majestic beast that lay before me. I marked myself with the blood of my prey so our spirits may become one in memory of Larry Benoit the best deer tracker in the world. I thanked this great beast for its life, felt sorry for taking it from this land, and said so out loud. Then I screamed for joy at the goal I had accomplished. After trying to calm my nerves, I attempted to fill my tag, bad Idea as I was still shaking. Shaking helped to get the pen working so ink would flow and I could fill the tag in the freezing rain. I had lost one water proof glove on the ground when I went after him, small sacrifice to pay for such an easy recovery. I quickly cleaned and dragged him to the trail knowing darkness was spreading. On the way down I saw fresh rubs he just made. I hiked a mile back to base camp as Mike did not hear my shots or answer the radio. When I arrived I let out a “GETSOME” to grab his attention, it worked. After a long drag in the dark Mike, myself and the beauty made it out to camp and celebrated. Pack a month worth of gear and food and drive six plus hours home. Three of the most exhausting days I have ever had hunting and the luckiest Adirondack hunting trip ever… Thank you dear Lord what a blessing! The relief of finding him so easily, LUCK of getting him on my birthday and the first day of hunting and being able to call him into me just thrills me to no end. He is not the king of the hill, but I will never complain about getting a 9-Point Adirondack buck... they are like unicorns! I enjoy the bounty he provides and glorify him with a mount to tell of the majestic beast that is the Adirondack Whitetail! I feel very blessed with this buck and the fact that Thanksgiving will be with family. 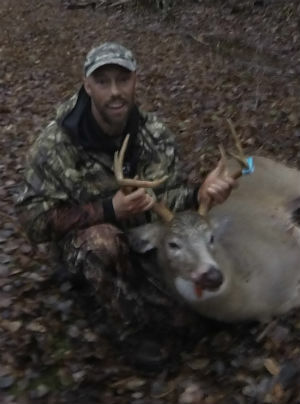 My third Hamilton County deep woods buck with a Winchester Model 94 in .44 Mag. While luck I believe is always a factor in hunting, my dedication to the sport, and prepping for it, is endless and helps ensure good luck has more of a role when I get these few chances at a great Adirondack Deep Woods Whitetail. 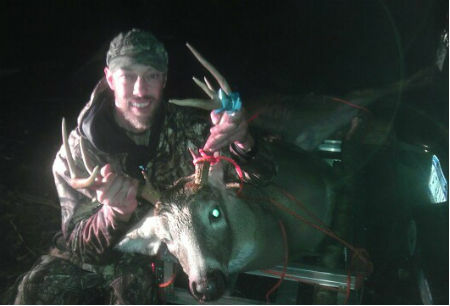 This Buck represents the crowning achievement of my Adirondack Deer Hunting and I couldn’t be prouder! Thanks you dear Lord for a safe trip and good health to do it. Thanks Mike for helping drag him out and making this a memorable trip. What started out as a month long adventure to fill what at times seemed like a dream, ended in one day of luck, bliss and even the sadness of taking this majestic animal. In true memory of Christopher James Flathmann this deer will go from 187 lbs. dressed to 287 lbs. and from a one mile drag to three, and from nine points to twelve. RIP Brother, no one told hunting stories as well as you! This trip is dedicated in memory of Christopher James Flathmann.